My experience was painless and I love my new smile. You must see Dr. Peter and his team for your dental care. I couldn't be happier with going here. I can't thank the staff enough for their kindness during my visit. They are the best dentists around! ... it's just like having normal teeth. Bring back your confidence with dental implants by Wisconsin Dental Solutions. As foremost Sun Prairie / Madison dental implant expert, Dr. Peter Lotowski has extensively studied surgical placement and esthetic restoration of dental implants. Many different reasons can result in the need for dentures. A full denture is a set of artificial teeth that rests on the gum line. It can often provide an excellent cosmetic result. Wisconsin Dental Solutions offers traditional and implant dentures. By choosing intraveneous (IV) sedation, you can now experience high quality dental care without pain and fear. IV sedation uses a combination of medications to create a calming, relaxing and unaware state. Don't let fear stop you from achieving a beautiful smile you deserve. You too can have the teeth you want and love! Wisconsin Dental Solutions was featured on local news! Watch the below NBC's "Better in 2017" news segment by clicking on the video. Special inteview with one of our patients and Dr Peter Lotowski. Wisconsin Dental Solutions is proud to bring hope to patients who think their smile is beyond repair. Whether you are missing a single or multiple teeth , have broken or worn down teeth, or dentures that do not fit properly - our experienced dental team will walk you through your options to ensure you have all the necessary information to choose the best treatment for you. With dental implants and IV sedation , Wisconsin Dental Solutions can help you regain your pride and comfort, as well as boost your confidence without pain or fear–no matter the condition your teeth are in today. Dr. Peter Lotowski of Wisconsin Dental Solutions is licensed to provide pain-free dentistry via intravenous (IV) sedation . IV sedation helps eliminate the dental fear factor by greatly reducing anxiety levels, memory and perception of pain and allows you to experience pain-free dental procedures in a relaxed and comfortable state. We believe that every patient deserves a unique and personalized dental solution and our skilled team specializes in providing "Dental Solutions for Extraordinary Needs." 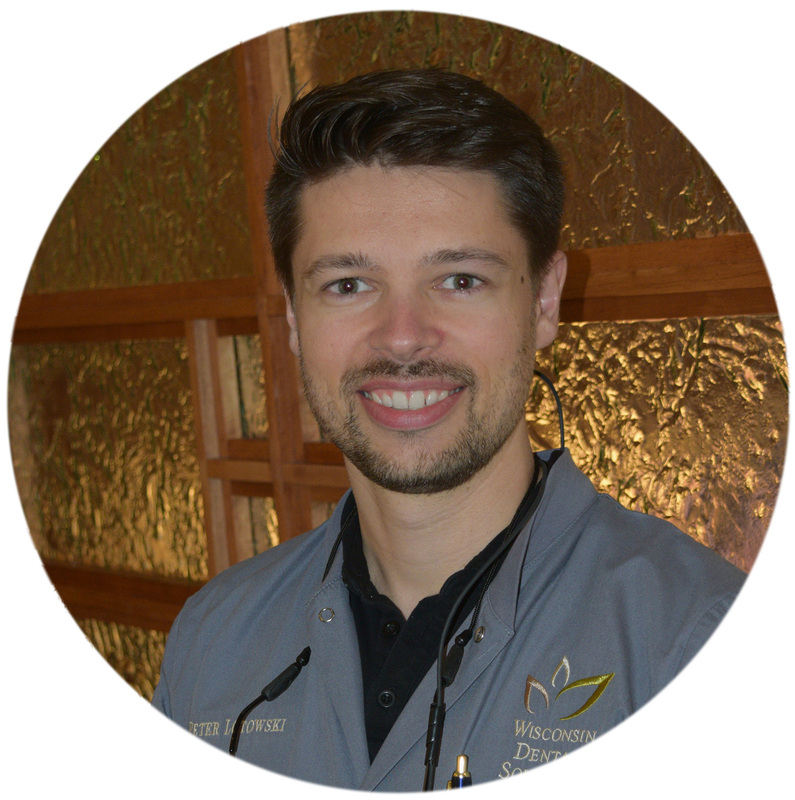 Read more about Dr. Lotowski or learn more about tooth replacement, crowns and bridges, dental implants, and dentures. With the latest dental technologies and all services provided at our location, our patients walk out of their implant procedures with beautiful new teeth. Our office is located in Sun Prairie, WI just 15 minutes from Madison. Click here to take a virtual tour of our office. Call us today at 608-834-6321 to set up your initial consultation. Meet the Smile Solutions Dream Team! Hello and welcome to Wisconsin Dental Solutions. My name is Agnes and dentistry has been a big part of my life for a decade now. Dr. Peter's dedication to exceptional patient care and dental excellence has been very inspiring and that is the reason why I also joined the Wisconsin Dental Solutions team. Hello, my name is Charlotte. I have been practicing dental hygiene for 16 years, but have over 23 years of dental experience. I am passionate about people and building them up, offering support and education in all areas that I can from personal, nutritional, spiritual or self-esteem. Hi, my name is Nicole. I have been a Dental Assistant for almost 25 years, and I have been working alongside Dr Peter since 2016. Being a Dental Assistant allows me to partner with my patients and help them achieve optimal oral health. Hi, my name is Dorothy and I have been a dental assistant for over 20 years. I truly enjoy all aspects of dentistry and feel blessed to be in a field where I can offer so much assistance and strength to others. I feel grateful to have been a part of my patient’s dental experience with every smile they share with me. Hi, my name is Angie. My experience in the dental field spans over 22 years. I am passionate about helping patients feel comfortable, at ease and good about themselves.